Stella Baraklianou, Island. The Wind Constantly, image courtesy of Set The Controls For The Heart Of The Sun. How do we create utopia? How do we reach it? And once there – how do we escape? These are the questions that preoccupy Greek born photographer and installation artist Stella Baraklianou and which she tries to resolve in her latest exhibition. In the installation, Baraklianou uses a reflective insulation material called Mylar – used by NASA, gold on one side, silver on the other and almost too bright to look at with the naked eye – to construct studio based reflectors that capture and explore the possibilities of light. On a residency in Canada she constructed a portable reflector and photographed in knee-high snow. These outdoor weather photographs form part of her installation Island. The Wind Constantly. When exhibiting in New York in 2016 under the group title Photography is Magic, Baraklianou’s work was itself described as being ‘like magic’. This remark took her to a place she had often mused upon: the Island, the place of perfection, the place of longing and of isolation. How to make this utopia real? Finding her personal utopia on the hottest of beaches, pressed down upon by sun and surrounded by sand and dotted around by starfish and shells, Baraklianou constructs a real-time, studio-based utopia arising from a unique relationship between photography, light and stilling time. It is, ultimately, the semiotics of the sun lounger that unifies the installation. The solid frame, borrowed from a run of the mill sun lounger, symbolises the materiality of beach culture. The bright, brilliant body of the lounger is carefully and meticulously hand woven out of super reflective Mylar. It lies glamorously as if it were the illusory resting place of the citizen of utopia or the lonely seat of the stranded Island dweller. Hugely influenced by reading – so much so that she describes it as another part of her practice – Baraklianou references J.G. Ballard’s decadent lost paradises and Thomas More’s ‘ideal society’. A society which may prove no haven at all for those who do not fulfil the profile for the ideal resident of Utopia. 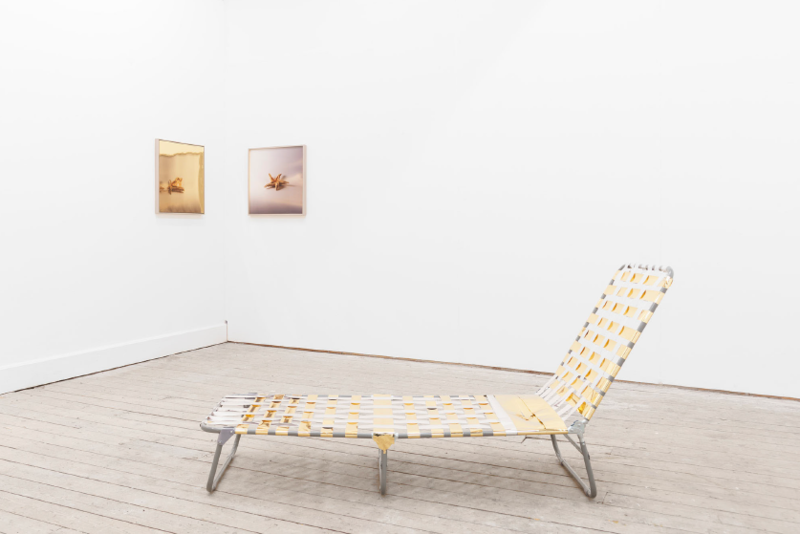 A traveller in the truest sense, Baraklianou questions the very space of utopia through the weaving of the sun lounger’s body. We find a tension between silver and gold; the reflected light plays with the photographs; or a playful starfish and shell. There is also the constructed Island itself, strange, unsettling and drenched in light. Walking her viewers around the Island, Baraklianou experiences with them a carefully curated theatricality. Its immersive, uncanny reflections allow for escape routes to personal and private internal paradises. Even after its de-installation, Baraklianou’s Island continues to exist on social media. It asks awkward questions about who is allowed into paradise and – once paradise reveals itself to be, as it must, potentially flawed – how might one escape. Island. The Wind Constantly, Set The Controls For The Heart Of The Sun, 26 April – 28 April 2017.